Hi! 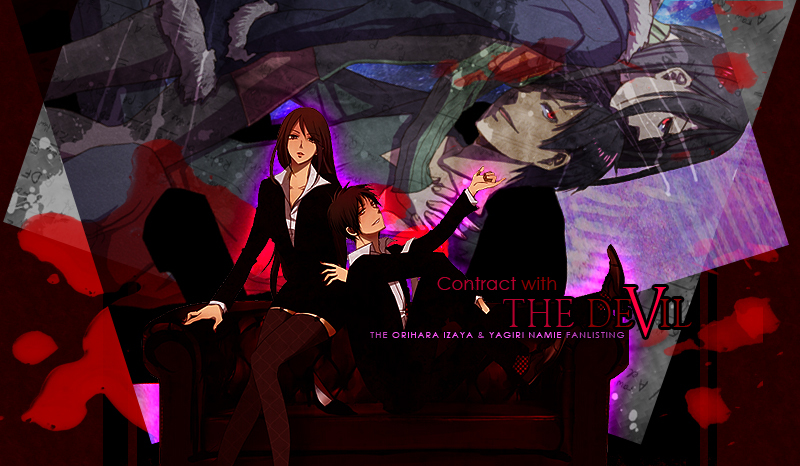 Welcome to "Contract with the Devil", the TFL and TAFL approved fanlisting for Orihara Izaya & Yagiri Namie , two awesome, evil and mysterious characters from the light novel series "DRRR", better known as Durarara! !, created and illustrated by the awesome Narita Ryohgo and Yasuda Suzuhito! The relationship between Izaya and Namie is better explained after the first novel and after the first half year of their meeting, because the development of the story is very focused about them and they share a partnership in job, and for a lot of reasons, in their own life. They keep together one of the most important secret of the series and that's the reason why I called this site "Contract with the devil", it's relative to both of them. For major informations about them and all the sides of their relation, feel free to visit the proper sections (you're warned, they contains a lot of spoilers). Please, choose a link from the right to fully access the site, and if you're a fan of Izaya and Namie , feel free to join their fandom! fan-site and I don't intende to violate them. Layout & contents © Dorothy. Do not reproduce.